The rhea has been the gift that keeps on giving. Saturday was my fourth session with some part of this bird, going back to 2006 (previous posts are here, here, and here). The first two sessions were just about reducing the bird to its component parts, and the last session was all about midline structures. 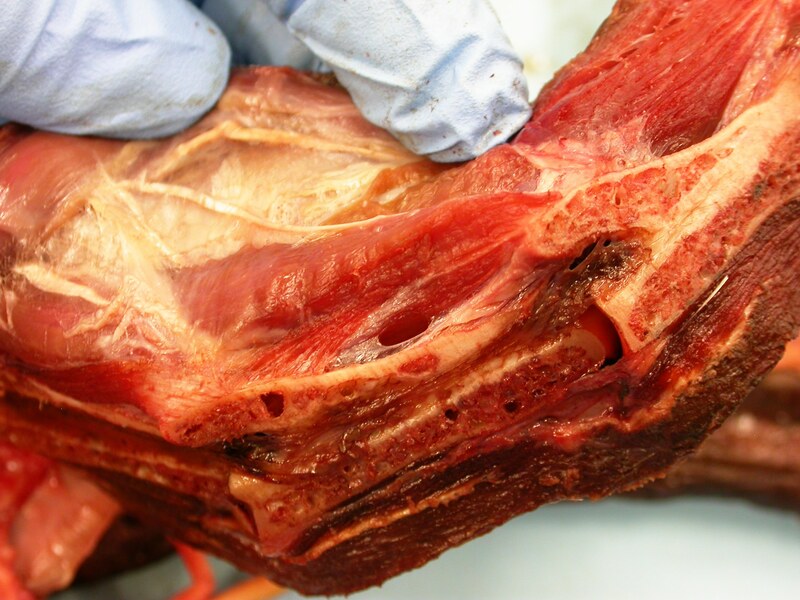 The goal for the neck is to dissect down to the vertebrae and document everything along the way–muscles, tendons, fascia, blood vessels, and especially diverticula. In the past I have been pessimistic about the chances of seeing diverticula without having them injected with latex or resin or something. But this bird is changing my mind, as we saw in a previous post and as you can see below. The goal for Vanessa is to grok all of this anatomy, and hopefully make some publishable observations along the way. 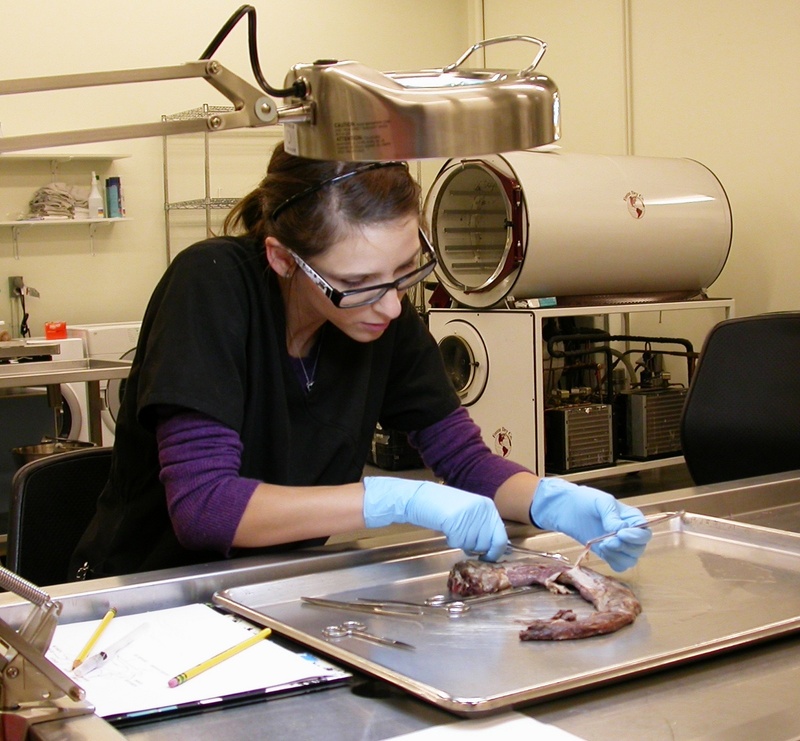 She has a chance to do something that I think is rather rare for a sauropod paleobiologist, which is to get a firm, dissection-based grounding in bird and croc anatomy before she first sets foot in a museum collection to play with sauropod bones. That sounds awesome, and probably will be awesome, but before there can be any awesomeness, the fascia has to be picked off the neck. And by ‘picked’ I mean ‘actually cut away, millimeter by arduous millimeter’. It wasn’t that bad everywhere–the fascia over the long dorsal muscles came off very easily. But the lateral neck muscles were actually originating, in part, from the inner surface of the fascia. That’s not unheard of, it happens in the human forearm and leg all the time, but I’ve never seen it as consistently as in this rhea. So picking fascia took a loooong time–that’s what Vanessa is doing in the photo at top. Once the fascia was off, Vanessa started parting out the long tendons of the hypaxial muscles in the left half of the neck. Meanwhile, I started stripping fascia from the right half. I had forgotten that the right half of the neck still had the trachea and esophagus adhered to the side. That probably sounds weird, given that our trachea and esophagus–and those of most mammals–run right down the middle of our necks and aren’t free to move around much. In birds, they’re more free-floating and can drift around between the skin and the vertebral muscles, sometimes even ending up dorsal to the vertebral column–there’s a great x-ray of a duck in a 2001 paper that shows this, which I’ll have to blog sometime. 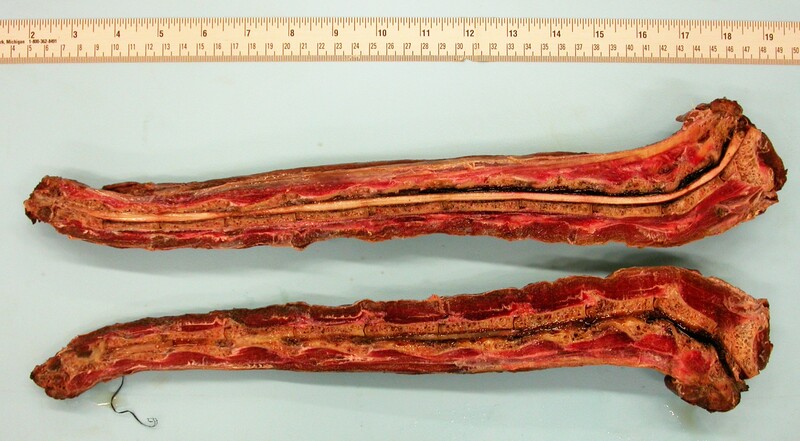 Anyway, when I cut the fascia to pull back the trachea and esophagus, I found that they were separated from the underlying tissues by a dense network of pneumatic diverticula winding through the fascia. I had heard, anecdotally, of networks of diverticula described as looking like bubble wrap. I can now confirm that is true, for at least some networks. What was especially cool about these is that they were occupying space that would be filled with adipose or other loose connective tissue in a mammal, which illustrates the point that pneumatic epithelium seems to replace many kinds of connective tissue, not just bone–something Pat O’Connor has talked about, and which I also briefly discussed in this post. 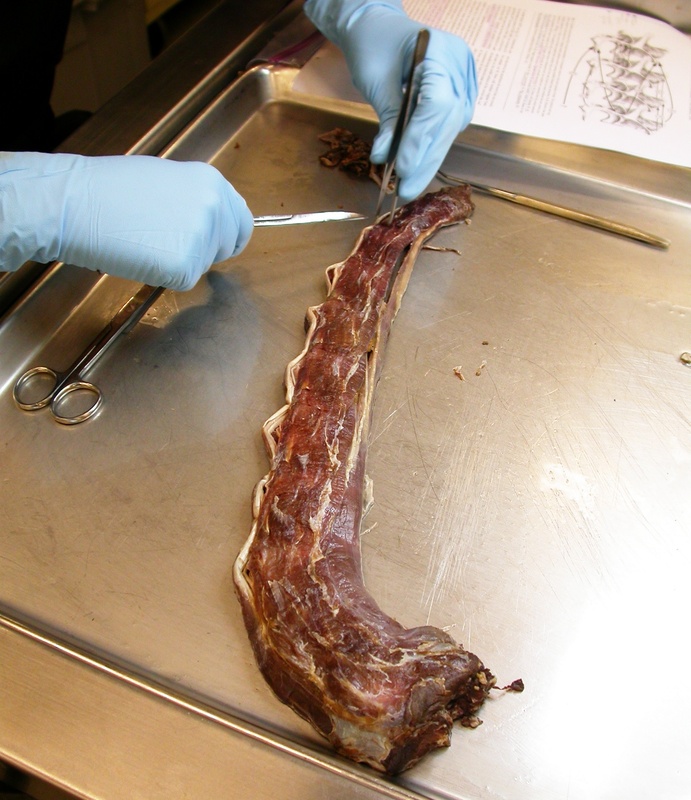 I should mention that there was no connection between these diverticula and the trachea, as there is between the subcutaneous throat sac and the trachea in the emu (story and pictures here). While I was geeking out on diverticula, Vanessa was methodically separating the long hypaxial muscles, which looked pretty cool all fanned out. And that’s all we had time for on Saturday. But we’re cutting again soon, so more pictures should be along shortly. When you last saw this rhea neck, I was squeezing a thin, unpleasant fluid out of its esophagus. Previous rhea dissection posts are here and here; you may also be interested in my ratite clearing house post. We did that dissection back in 2006. Since then I finished my dissertation, got a tenure-track job, and moved twice. The rhea neck followed me, living in a succession of freezers until last spring. Last spring I thawed it out, straightened it (it had been coiled up in a gallon ziploc), refroze it, and had it cut in half sagittally with a bandsaw. I did all of this for a project that is not yet ready to see the light of day, but there’s a ton of cool morphology here that I am at liberty to discuss, so let’s get on with it. Throughout the post, click on the images for full resolution, unlabeled versions. 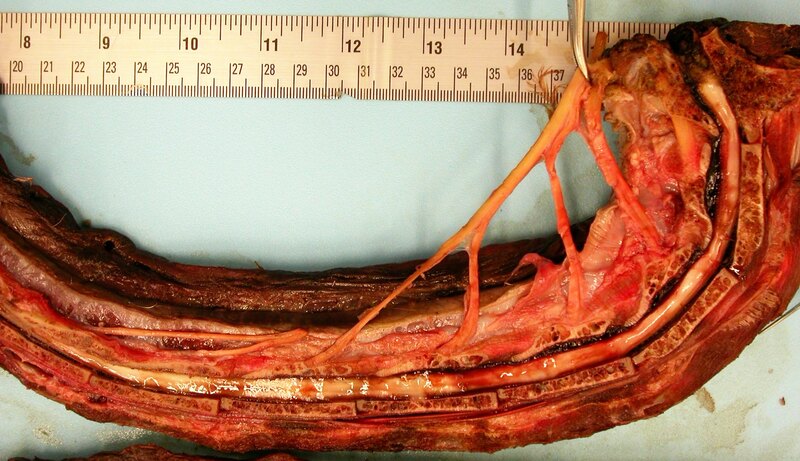 In the image above, you’ll notice that the saw cut was just slightly to the left of the midline, so that almost the entire spinal cord was left in the right half of the neck (the one toward the top of the image; the left half, below, is upside down, i.e. ventral is towards the top of the picture). The spinal cord is the prominent yell0w-white stripe running down the middle of the hemisectioned neck. It’s a useful landmark because it stands out so well. Dorsal to it are the neural arches, spines*, and zygapophyses of the vertebrae, and epaxial muscles; ventral to it are the vertebral centra and the hypaxial muscles. * If you want to call them that–some of them are barely there! Note how the actual profile of the neck is vastly different from what you’d suspect based on the skeleton alone. This is one of the reasons that necks lie. For more on the supraspinous ligament in rheas and its implications for sauropods, see Tsuihiji (2004) and Schwarz et al. (2007). Birds also have very large interspinous ligaments (lig. elasticum interlaminare), each of which connects the neural spines of two adjacent vertebrae. 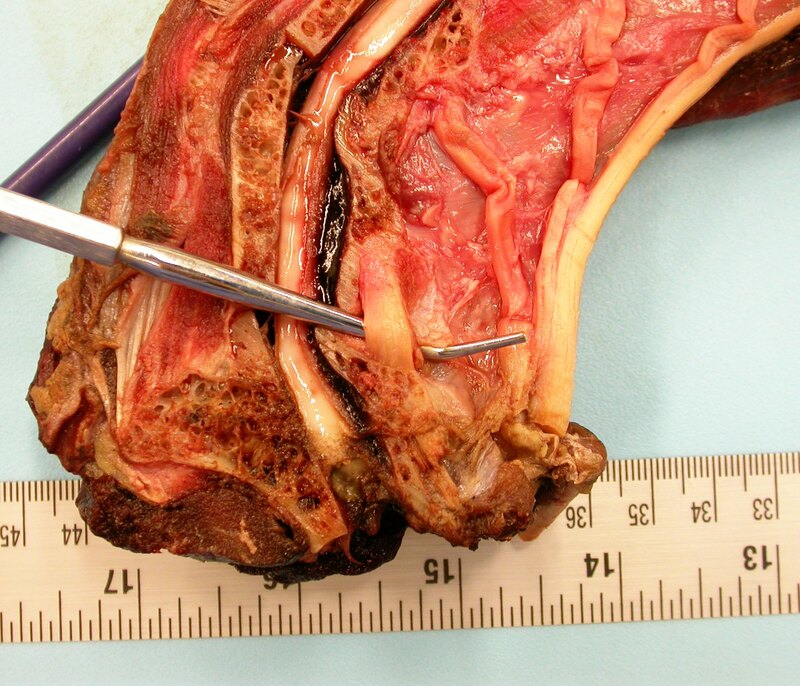 In the above photo, the blunt probe is passing under (= lateral to) the unpaired, midline interspinous ligament. Rheas are unusual among birds in having such a large supraspinous ligament, and you can see that this interspinous ligament is almost as big. 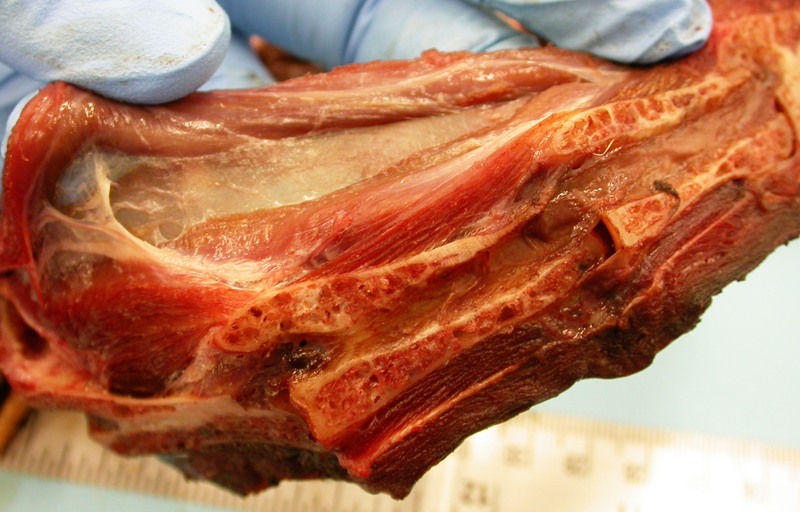 If you tear down the neck of a chicken or turkey, you will find huge interspinous ligaments, and the supraspinous ligament will be tiny if you can identify it at all. Here’s something I don’t think we’ve ever shown before here on SV-POW! : a photograph of an actual pneumatic diverticulum. That’s the dark hole in the middle of the photo. You can see that we’re in the left half of the neck, lateral to the spinal cord, almost to the postzygapophysis, the articular surface of which is more lateral still (“below” or “deep to” the surface you see exposed in this cut). Usually at each intervertebral joint there is a connection between the lateral pneumatic diverticula that run up the side of the cervical column and pass through the cervical rib loops and the supramedullary diverticula that lie dorsal to the spinal cord inside the neural canal. That connecting diverticulum is the one exposed here. Here are pneumatic diverticula in a transverse CT section of an ostrich neck (Wedel 2007b: fig. 6; compare to Wedel 2003: fig. 2, another slice from the same neck). 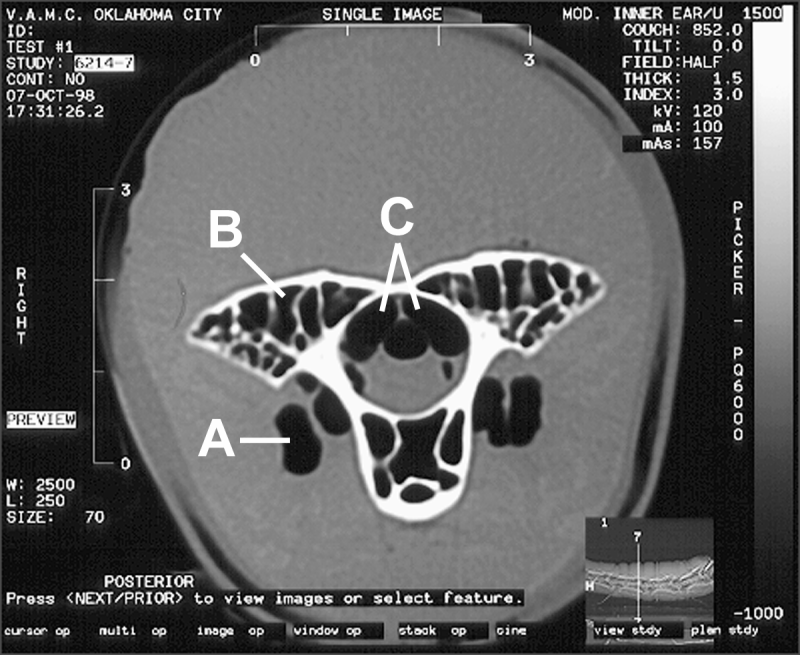 In this view, bone is white, muscles and other soft tissues are gray, and air spaces are black. A, lateral diverticula running alongside the vertebral centra. B, air spaces inside the bone. C, supramedullary airways above the spinal cord. This section is close to the posterior end of a vertebra; the flat-bottomed wing-like processes sticking out to either side are the anterior portions of the postzygapophyses. If the slice was a few mm more posterior, we would see the prezygapophyses of the preceding vertebra in contact with them. Also, the vertical bars of bone connecting the centrum to the postzygs would pinch out, and we’d see the diverticula connecting the lateral (A) and supramedullary (C) airways–that’s the diverticulum revealed in the photo two images up. 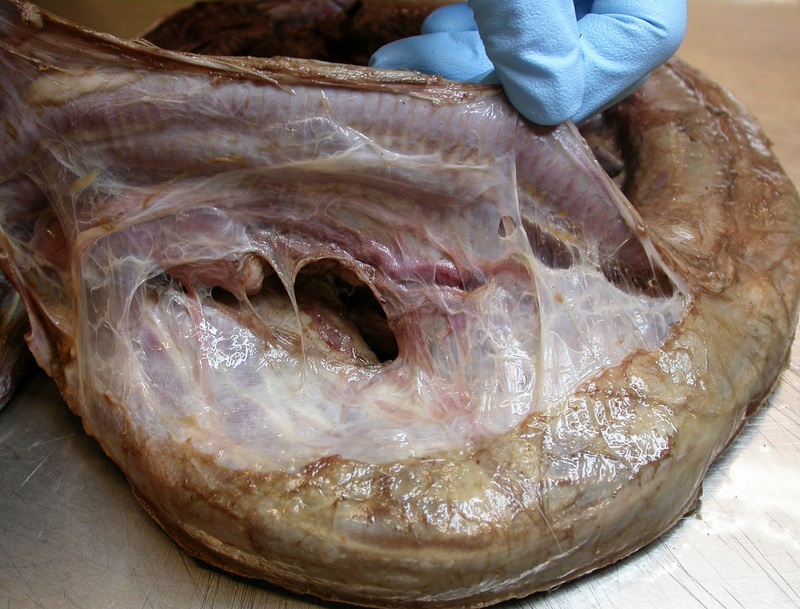 Here’s another cool section showing a diverticulum and some muscles. Note the short interspinous muscles, which connect the neural spines of adjacent vertebrae. The probe indicates another open diverticulum, and the very tip of the probe is under one of the very thin layers of epithelium that line the diverticula. You can see that this diverticulum lies on the dorsal surface of the vertebra, posterior to the prezygapophysis and anterior to the neural spine. 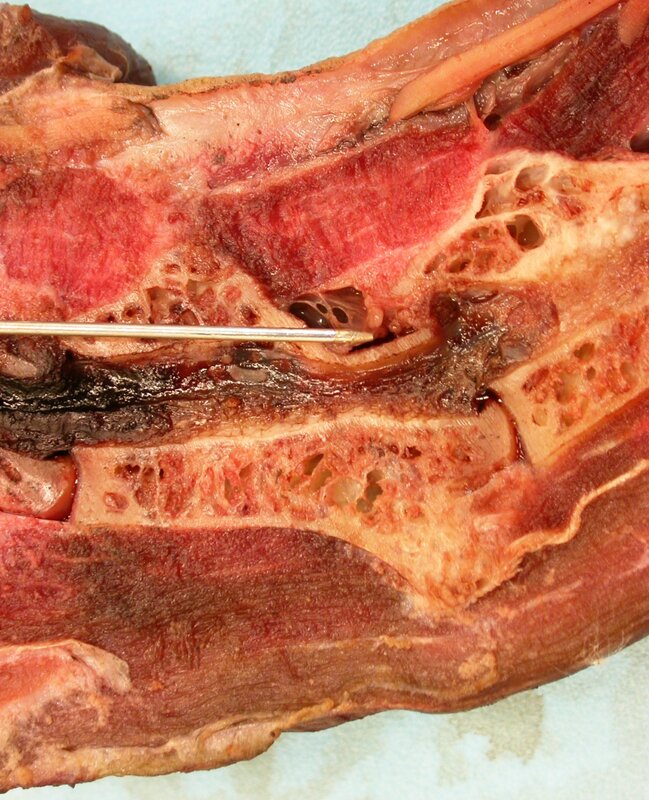 This supravertebral diverticulum is near and dear to my heart, because I have published an image of its traces before. If progressively more basal taxa are examined in the quest to find the origin of PSP [postcranial skeletal pneumaticity], the problem is not that evidence of PSP disappears entirely. It is that the shallow, unbounded fossae of basal dinosaurs are no longer diagnostic for pneumaticity. For more on that problem, see Wedel (2007a) and the post, “X-Men Origins: Pneumaticity”. The other labelled bits in the above photo are all muscle attachment points, and you may find Wedel and Sanders (2002), especially Fig. 2, a useful reference for the rest of the post. The dorsal tubercles, or epipophyses, are rugosities dorsal to the postzygapophyses that anchor most of the long, multi-segment epaxial muscles, which in birds are the M. longus colli dorsalis, which originates on the anterior faces of the neural spines, and M. ascendens cervicalis, which originates on the cervical rib loops. 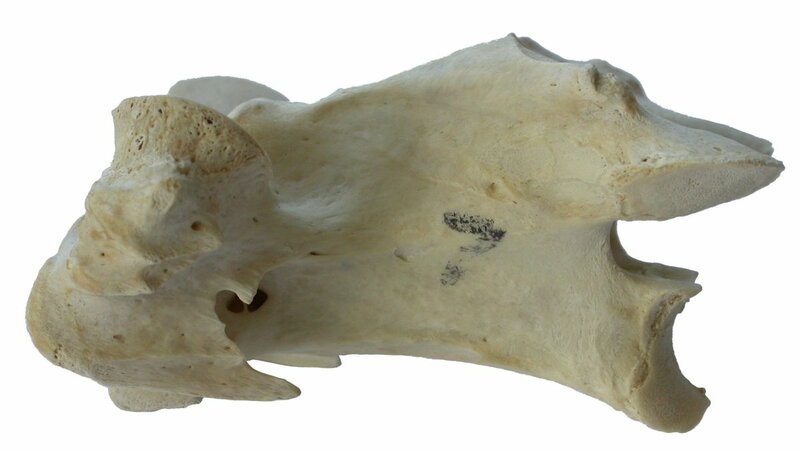 The crista transvers0-obliqua is a low, bony crest connecting each dorsal tubercle to the neural spine; it corresponds to the spino-postzygapophyseal lamina (SPOL) of sauropods (see Tutorial 4: Laminae! ), and anchors the Mm. 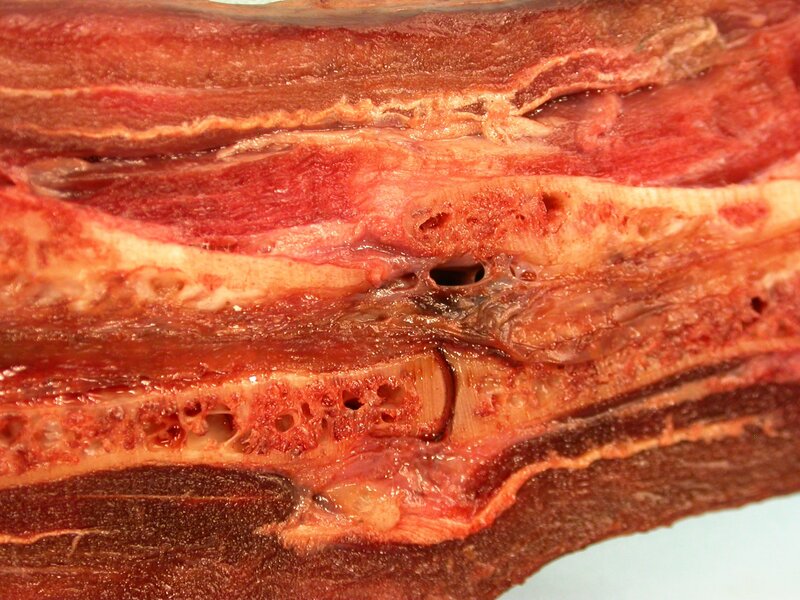 intercristales, a group of short muscles that span the cristae of adjacent vertebrae, like the Mm. interspinales only more lateral. The carotid tubercles serve as points of origin for the M. longus colli ventralis, one of the largest and longest of the multi-segment hypaxial muscles; they have no obvious homolog or analog in sauropods. The lack of this feature might indicate that the hypaxial muscles were less of a big deal in sauropods, for whom lifting the neck was presumably a bigger problem than lowering it. Alternatively, the M. longus colli ventralis of sauropods might have attached to the medial sides of the parapophyses and the capitula of the cervical ribs, which tended to be larger and more ventrally-directed than in basal sauropodomorphs and theropods. The unlabeled red arrows mark the lateral tubercles and crests of the cervical rib loop, to which we will return momentarily. 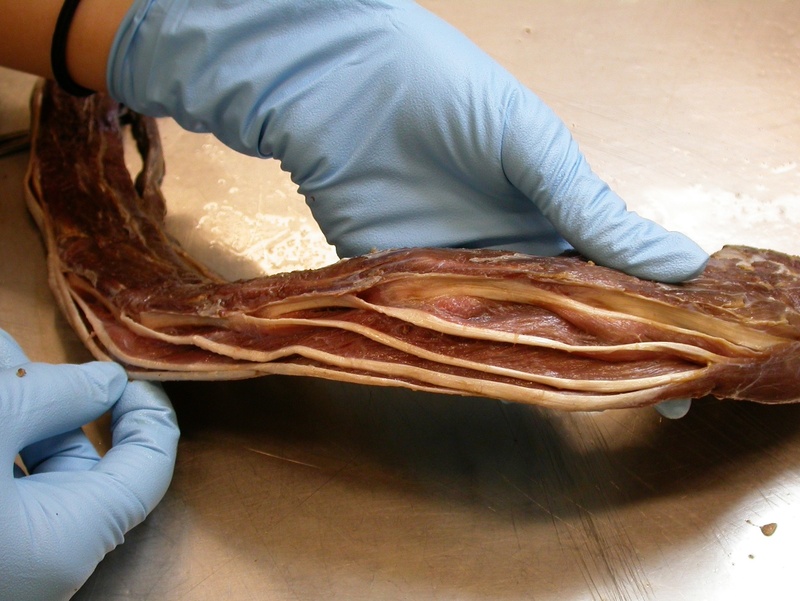 Here you can see a big bundle of long epaxial muscles, including both the M. longus colli dorsalis and M. ascendens cervicalis, inserting on the left dorsal tubercle of the vertebra on the right. Note that the cut here is quite a bit lateral of the midline, and actually goes through the lateral wall of the neural canal in the vertebra on the right (that vert is the fifth back from the front of the section of neck featured in this post, which is incomplete). That is why you see the big, multi-segment muscles here, and not the shorter, single-segment muscles, which lie closer to the midline. 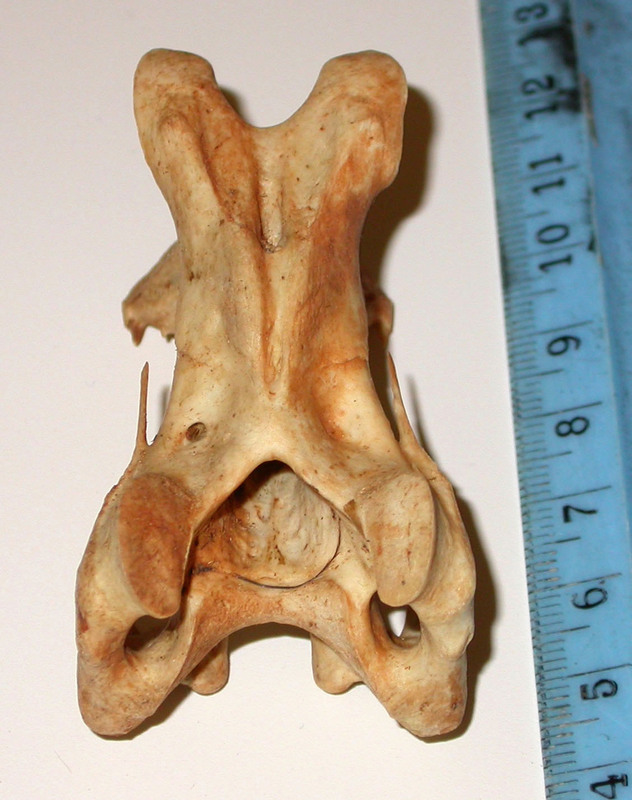 Here are some more muscle attachment points in a bird vertebra (a turkey this time, courtesy of Mike). The lateral crests and tubercles (tubecula ansae and cristae laterales, if you’re keeping track of the Latin) are the same bony features indicated by the red arrows in the photo of the emu vertebra up above. They anchor both the long M. ascendens cervicalis, which inserts on the dorsal tubercles of more anterior vertebrae, and the short Mm. intertransversarii, which span the cervical rib loops of adjacent vertebrae. Sauropods usually have at least small rugosities on their diapophyses and the tubercula of their cervical ribs (which articulate with the diapophyses) that probably anchored homologous muscles. Here’s a dorsal tubercle above the postzyg on the neural arch of a juvenile Apatosaurus (cervical 6 of CM 555, shown in right lateral view). Notice that the spinopostzygapophyseal lamina (SPOL) and postzygodiapophyseal lamina (PODL) actually converge on the dorsal tubercle rather than on the postzyg. This is pretty common, and makes good mechanical sense. Dorsal tubercles again, this time on the world’s most wonderful fossil, cervical 8 of the HM SII specimen of Giraffatitan brancai, in the collections of the Humbolt museum in Berlin. While you’re here, check out the pneumato-riffic sculpting on the lateral faces of the neural arch and spine, and the very rugose texture on the tip of the neural spine, SPOLs, and dorsal tubercles. 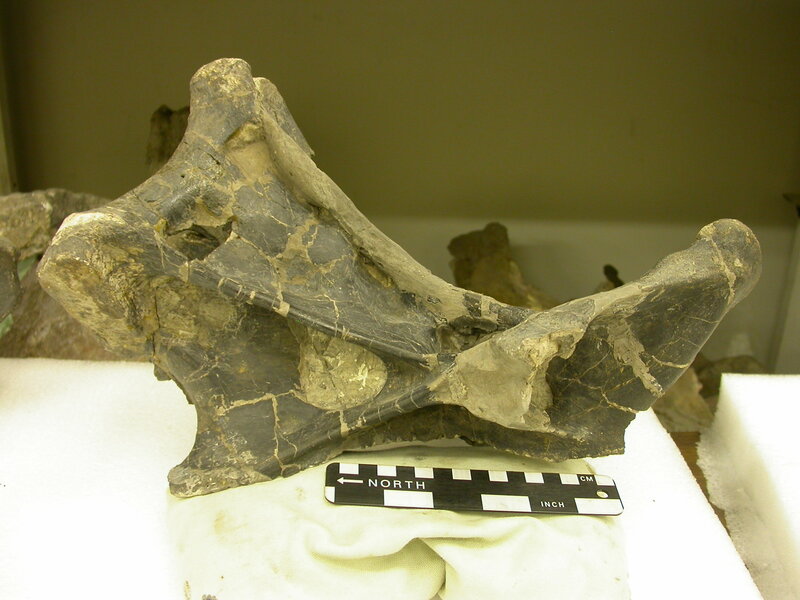 In fact, compare the numerous pocket-like external fossae on this vertebra with the internal air cells exposed in the cross-sectioned rhea neck. I have argued here before that sauropod cervical vertebrae are pretty similar to those of birds; the main differences are that the cervical rib loops are proportionally much smaller in sauropods, and sauropod vertebrae mostly wore their pneumaticity on the outside. Farther anteriorly in the neck–the three vertebrae pictured here are the third, fourth, and fifth (from right to left) in this partial neck–and somewhat closer to the midline. Now you can see some short epaxial muscles, probably Mm. intercristales and Mm. interspinales (the two groups grade into each other and are often not distinct), spanning adjacent vertebrae. As in several previous photos, the supravertebral diverticulum is visible, as well as the communicating diverticulum that connects the lateral diverticula to the supramedullary airways. I forgot to label them, but ventral to the centra you can see long, light-colored streaks running through the hypaxial muscles. These are the tendons of the M. longus colli ventralis, and in some of the previous photos you can see them running all the way to their origination points on the carotid tubercles. These extend posteriorly from the short cervical ribs of birds, and are homologous with the long cervical ribs of sauropods. That’s all I have for this time. If you’d like to see all of this stuff for yourself, turkey necks are cheap and big enough to be easy to work with. Geese are good, too. You can see all the same bits in a chicken or a duck, it’s just harder because everything is smaller (if you’re a real glutton for punishment, try a Cornish game hen). When I first started working on sauropods, their cervical vertebrae made no sense to me. They were just piles of seemingly random osteology. The first time I dissected a bird neck was an epiphany; ever since then, it is hard for me to look at sauropod vertebrae and not see them clad in the diverticula and muscles that shaped their morphology. Go have fun. Tsuihiji, T. 2004. The ligament system in the neck of Rhea americana and its implications for the bifurcated neural spines of sauropod dinosaurs. Journal of Vertebrate Paleontology 24: 165–172. Wedel, M.J. 2003a. 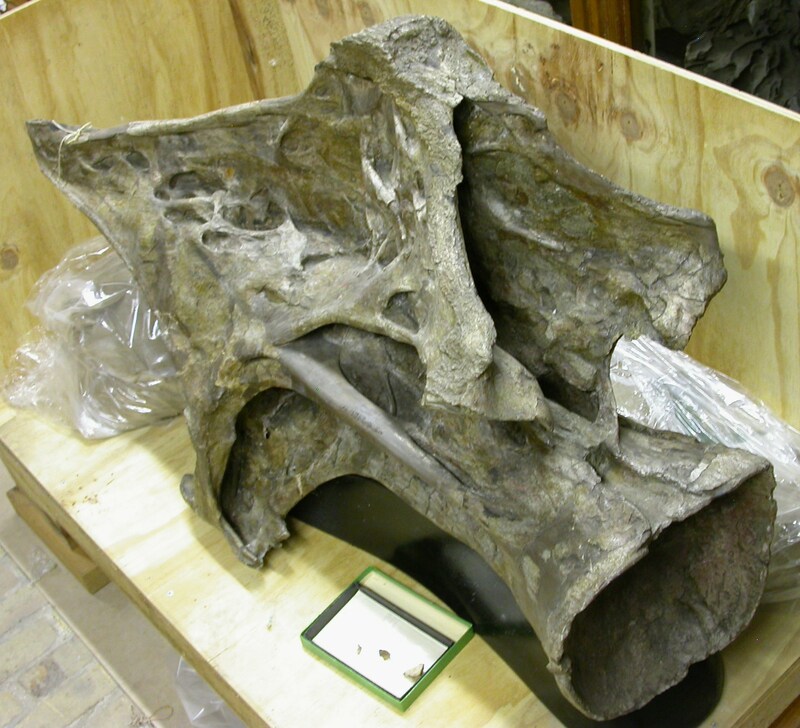 Vertebral pneumaticity, air sacs, and the physiology of sauropod dinosaurs. Paleobiology 29:243-255. Wedel, M.J. 2009. Evidence for bird-like air sacs in saurischian dinosaurs. Journal of Experimental Zoology 311A(8):611-628.